"I can't say enough about how game changing Flare has been for us.We now have powerful desktop software that lets us quickly and easily customize content to support the different needs of our users"
Creating a friendly, intuitive customer experience is a top priority for Fellowship Technologies. The company delivers church management software as a service (SaaS), which is designed for dynamic churches of any size or denomination. 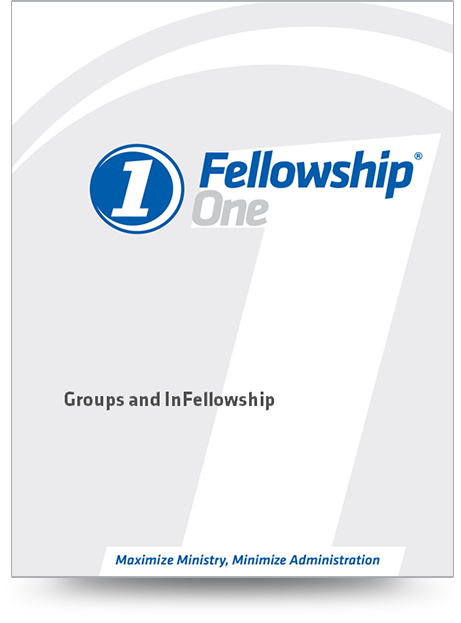 Today its flagship Fellowship One software is used by more than 1,500 churches and some 43,000 registered users worldwide. Because many of the church members using Fellowship One are not technology experts, MadCap Flare plays an important role in enabling the Fellowship Technologies education services team to provide Web-based Help and print documentation that is intuitive and easy to use. The team also takes advantage of Flare's multi-channel single-sourcing functionality to use existing content and develop Fellowship Technologies' annual conference guide in less than one week–over four times faster than was possible using the business' previous authoring solution. "The customers' funds to pay for our SaaS solution come from tithes and offerings to the churches, so we are very conscientious about our expenses. Most of our revenues go into the software, and we have to make a very good case for how any purchase is going to help us better serve our customers," said Tara Coulson, Fellowship Technologies manager of education services. "With MadCap Flare, making that case was easy. We now have powerful desktop software that lets us quickly and easily customize content to support the different needs of our users." Prior to using MadCap Flare, Fellowship Technologies relied on a legacy authoring tool that didn't readily support the repurposing of content for different Web and print formats. As a result, the education services team often had to manually modify content for each purpose, whether it was the online Help system, printed documentation for users, road show handouts, or the annual Dynamic Church Conference guide. "Our annual conference guide was particularly challenging, since the old authoring solution was not good for print documentation, and we always had to fix the bulleting and numbering," Ms. Coulson recalls. "It was very time-consuming, and preparing the guide for our May conference often meant starting the process in April or even March." By contrast, Ms. Coulson says, "With Flare's single-sourcing, the content for the conference guide is essentially all there. It's just a matter of building the targets and table of contents, and even though we have more than 56 targets, it takes less than a week to complete. Now the hardest part is getting the guide over to the printer to be published and bound." "The single-sourcing and ability to publish in multiple formats with Flare has allowed us to expand our services," said Ms. Coulson. "Over the last two years of using Flare, we've added a certification project, developed in-house training, and created Road Show training. We never would have been able to do that in the past." Today, the education services team uses one master MadCap Flare project to maintain a large Web-based Help system for its flagship Fellowship One product. 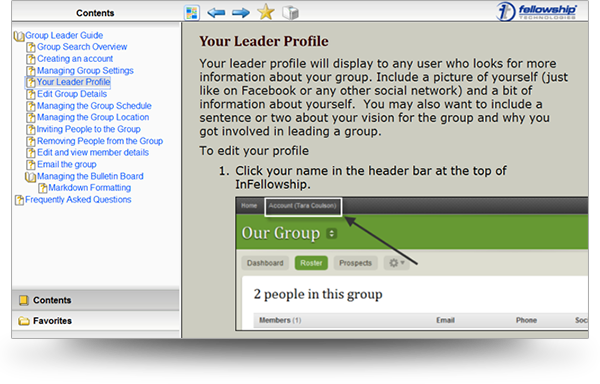 Because of the context-sensitive Help design, users can simply click on an icon in Fellowship One to jump into the relevant topic within the online Help. The same Flare project for publishing the Web-based Help system also is used to produce a range of print documentation. 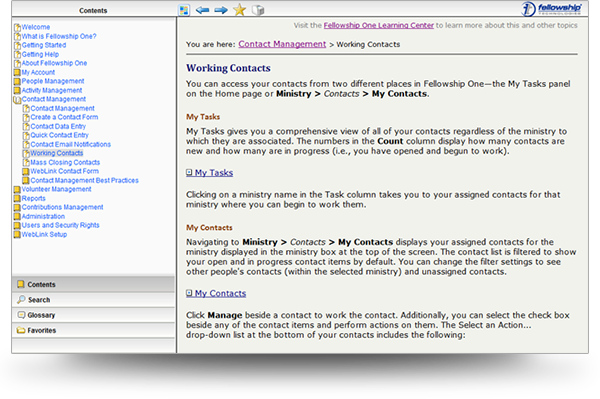 Most recently, Fellowship Technologies added a mini Help system for users of its Groups 2.0 church community program, which is used by leaders of small groups within the church. "Adding this Help system for the customers of our customers was easy," Ms. Coulson recalls. "We kept it in the same Flare project, and it was just a matter of creating a new skin and output type. The build came out perfectly." Another boost to productivity has been the ability to integrate MadCap Flare with the Microsoft Team Foundation Server, says Ms. Coulson. She notes, "We wanted to truly single-source without having to do multiple projects, Since we hooked MadCap into Microsoft TFS, my colleague, Kara Blackhawk, and I have been able to access our Flare project at the same time and then have changes all merge together. It really helps our ability to collaborate and be more efficient." Recently, the education services team has begun using MadCap X-Edit, which is allowing a new team member to review and edit the Flare topics without having to learn the entire MadCap Flare software. Going forward, Fellowship Technologies plans to extend the use of X-Edit to the implementation team that goes to churches to show customers how to develop processes. "When our implementation team members are with customers, they often glean recommended improvements to our software. X-Edit will let them capture this feedback and then easily bring the changes and comments back into our Help system," Ms. Coulson explains. "We're also seeing interest from our support department where people would love to be contributors. Additionally, it will make it easier for our business analysts to review the documentation and make sure it has appropriate use cases and exceptions criteria." Ms. Coulson adds, "Sometimes I think back to how much work we had to do manually just to produce our core Help system and print documentation. I can't say enough about how game changing Flare has been for us."